When you arrive in Copenhagen, it’s likely that you are stunned by the amout of cyclists in the street. So – what is different here? How did it happen that more than half of Copenhageners use bicycles every single day? Here are some thoughts and findings on that, ranging from more “psychological” aspects to hands-on traffic management. In Copenhagen, people bike when it’s hot or cold, snowy or rainy, early or late, day- or nighttime. They use the bike for short trips or for hourly commutes. It’s students and CEOs, poeple going to work or to a party, elderly people and kids that bike. You do not need to be a hipster tor feel comfortable in the crowd – everyone does it. The bikes you see parked on the streets are mostly older, not-so-fancy ones. Which makes perfect sense: Riding a bike in Copenhagen is no lifestyle statement, it’s a mere commodity. And you would not want your “commodity” get stolen, just because your bike looks fancier then anyone elses. The bike lanes are massive, and they are everywhere. And by massive, we mean: Often allowing three people to bike next to each other to enable so called “conversational cycling”. They are seperated from the moving car traffic and the sidewalks, minimizing the conflict potential. Whole bridges are being built right now that will be acessible only to cyclists. And there are the so-called cycle highways that build routes from the surrounding regions directly into Copenhagen, where the far distance commuters’ needs have been given the highest priority: You can bike up to 20 km without interruptions. “Green waves” are something that helps to minimize interruptions where cyclists have to stop and wait for the green light. It’s actually simple: Coordinate the traffic lights for cyclists so that if they ride at a speed of 20 km/h, they will hit green lights going into the city center in the morning rush hour. The wave is reversed in the afternoon when people drive back home. And the newest approach in a pilot project: Little LED lights on the side of the street showing you to slow down or speed up in order to make it to the green light to make your irde even smoother. Taxis have to have bike rests, metro trains have cycle cars. In general, the city gives cyclists the feeling that they are their favorite traffic participants. They get green lights faster than car drivers, they have more space and freedom where to go, in winter, the bike path cleaning is prioritized over street cleaning. Which makes biking smooth and comfortable, and driving a car, well – not really advisable. 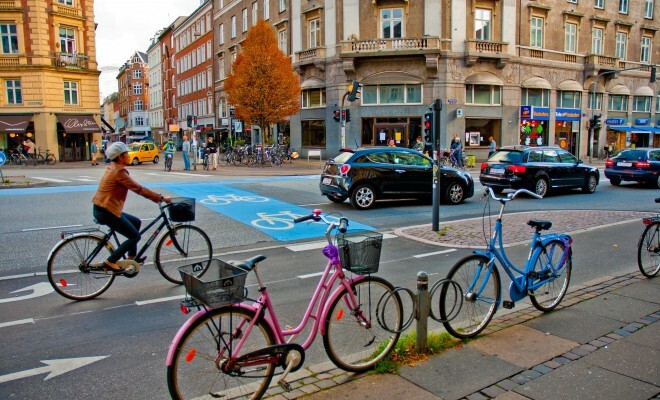 Copenhagen has a cycling strategy up to 2025, called “Good, Better, Best” with even more ambitious goals concerning travel time, sense of security, comfort and lifestyle. You can download it here. Next week: How did Copenhagen become the traffic innovation mekka it is today? We talked to Mikael Colville-Andersen, CEO of Copenhagenize Design Company.